With a special out of town visitor (potential cooking adventures there... it's CARA! ), a ladies night planned, and a husband in tech week for a local theatre production, and general craziness this week's menu includes... LEFTOVERS and flexibility! I didn't want to plan too much in case Cara and I do some fun cooking. Sometimes you have to plan to have no plan! Have a great week everyone. Butternut squash soup (recipe coming Tuesday). Leftover pasta salad from last week. P.S. I got a nice bag of garlic from New City Market. I have been consistently underwhelmed by the garlic selection at Hy-Vee and Dahl's. Lots of tiny cloves hidden in the core and dry brittle, like it's been on the shelf forever. New City had a pound bag of garlic for $6. 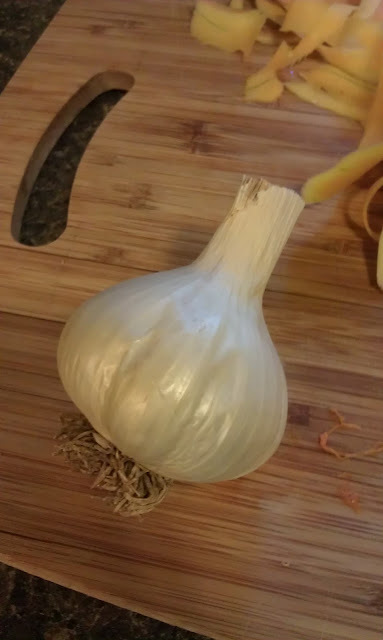 look at this perfect, beautiful garlic! !